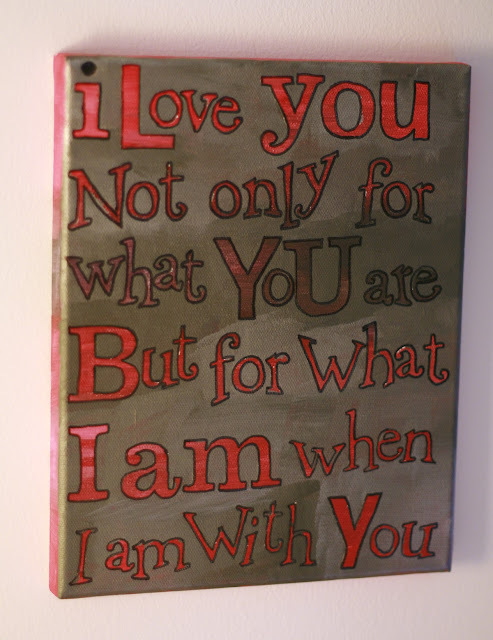 Instead of a card this year for Valentine's day, say I love you on canvas. I picked up a 5x7 inch canvas at Michael's and set to work with my acrylic paint. First I covered the canvas with broad strokes of pink and red paint making sure to also paint the sides, then I waited for it to dry. 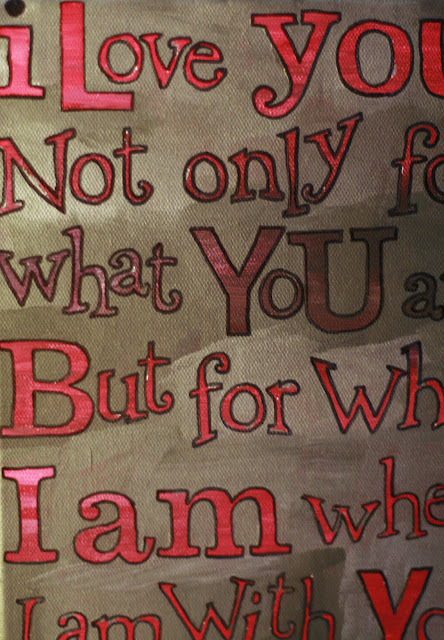 Once it was dry I took alphabet letters that I bought in the scrapbook section and by mixing the different style letters was able to cover the canvas with this quote : " I love you not only for what you are but for what I am when I am with you." I then painted on top of the letters in a gray paint blended with white. As far as the painting goes there was no rhyme or reason to it, I just mixed colors until I liked what I saw and applied it the same way. Once the gray paint was dry I then very carefully pulled off all the stickers so that you could see the pink/red paint colors. Using a fine tip sharpie pen I outlined each letter in black to really make it pop! Share your ideas for Valentine's day gifts in the comments section.